I have two months to go. If you're NOT pregnant, your response is guaranteed to be, "Only two months?" and if you ARE pregnant (or have recently been), you will understand when I say TWOOOOO MONNNNNTHS, WAAAAAAHHHHH ! Because when you're the one who's pregnant, it feels like for.ev.er. And especially forever if you're not feeling great. But I had a really good day today and for the first time in weeks feel like, ok, two months, I can handle that. So needless to say, we are very excited for the little arrival. We have done some nursery preparations. It looks pretty sweet in there, even if I was too lazy to paint. 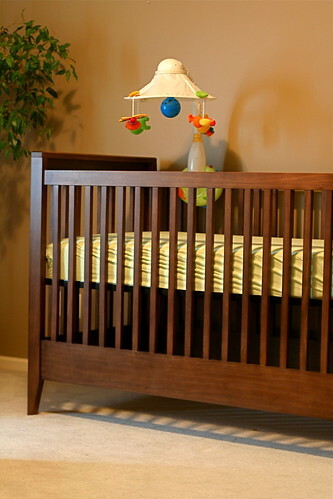 Here is our new crib, since Bella's got recalled and had to be dismantled and covertly thrown into a University dumpster. And of course, a little knitting. 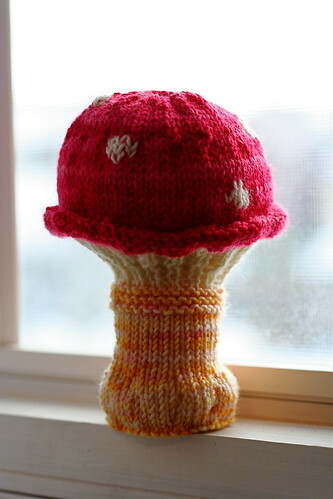 A Toadstool Rattle. This little guy has given me some great inspiration for other woodland items for the nursery. But that may have to wait since I have a few other crafty irons in the fire right now (um, have I mentioned I'm sewing an exact replica Dora Backpack?). A baby sweater. 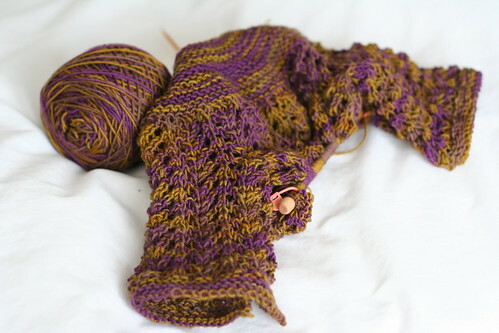 I must have been knitting with too many pastels lately, because I am so in love with this olive/eggplant yarn. Fondle-y, goo-ily in love. You could put a baby alligator in this sweater and I am going to want to rock it and hold it and feed it bottles. The last two months I know will go by quickly. Now that I'm hopefully on the road to feeling better, this calm before the storm can be a time of preparations, anticipation, and excitement. Bring it on! Did I not say Squealingly Adorable?